Home / Art Biz / "Dear Artist, Congratulations…"
Thus began the letter from the Santa Cruz Art League. It said that my work was accepted into their upcoming Beasts On Broadway, Animals Galore exhibit, which was juried by George Rivera, Executive Director of the Triton Museum of Art in Santa Clara, CA. Well, triple yippee to that! This letter is also heaps sweeter in ways beyond its YES! to my art and my efforts to take it into the world for Show and Sell. It says YES! to rats and YES! to pertinacity. Rats are one animal that get a bad rap over their historically, and admittedly not undeserved, bad rep. Yet to categorically reject all rats is, well, Rattism. You can find lots of positive action websites dedicated to easing that prejudice. Look, there goes one now. My piece is more personal than political, though. Rats, even pet ones, just don’t live very long. Two-three years. This life-size rat sculpture is for all the gentle females that came to be cared for and then leave my sons: Zelda, Kiwi, Latte, GL (short for Greased Lightning,) the One-Who-We-Can’t-Quite-Remember-Her-Name-Right-Now, and dear Moose. They are buried in a group in our redwood grove with a sign, RaT pAcK, posted on a nearby trunk. 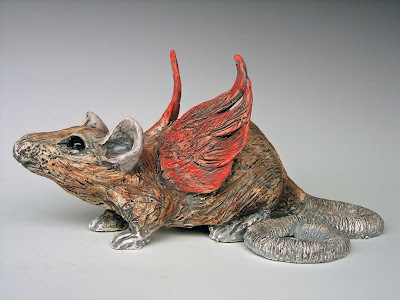 Ratty Got Her Wings is my way of saying a heartfelt thank you to those animals. I’m certain that the intimate knowledge of their bodies and movements allowed me to fold that love into the sculptural form I had in mind. Here are two more detail shots of the piece: Oh my, that dreaded snaky tail and a perky face because a rat knows you,just like a dog does. So, what about that acceptance letter’s ratification of pertinacity (a $2 word for doggedness)? Like Weight Watchers, I have joined the Santa Cruz Art League at least four times since I moved here in 1989. I’d join for a year, desultorily put something in the everyone’s-included Annual Members’ Exhibit, never quite figure out what else I could do to become involved there, feel awful artistic angst and let the membership lapse. In a common case of sour grapes, I mentally thought of it as The Fart League, which surely is neither clever NOR original. Last year, however, I joined with some goals in mind and I knew that if I did not see them realized, I would understand why, not feel bad and move on to other venues for my work. In one way or another, though, I have been perfecting my art my whole adult life. But I have been effectively perfecting how I package and present that art less than a year. (Read my last post about my business card saga, just to hear one story about this.) 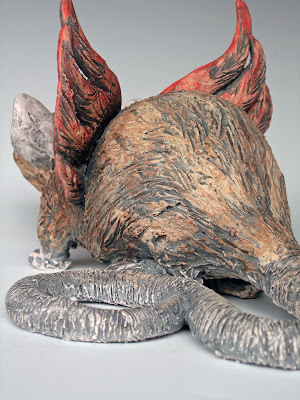 One of my undeniable artbiz mentors is Alyson Stanfield. And now, as I wind up an online blogging class with her and Cynthia Morris, I can say a personal but public thank you to them. And to the other students I have struggled alongside, who I have come to know through their questions, humor and writing: Dear Artists, Congratulations! Hey Liz, Congratulations to you. I have really enjoyed being in the class with you. I love your sense of humour in your work and in your blog posts. Let's keep in touch. BTW, I ordered some MOO mini cards and some notecards. Can't wait to see them. Now you've got me curious what will happen with this rat sculpture in the exhibit of all the animals. Will it be the only rat? Maybe! In the meantime, thanks for staying in touch and I am liking to visit your blogs as well….Good for us! The rat is so cute! What a wonderful little gem he is. Congratulations on the show. Have fun and remember to post pictures. It's so exciting to see people from the blogging class having success! Liz, your blog looks great. I need to check it out more closely for the changes you've made, but can tell you learned a lot in Alyson's class. And congratulations on your acceptance. I love the rats. Glad you got in. Susan, Terry, Carrie and Jackie, milles mercis for your enthusiasm for exhibits AND rats. I plan on staying connected with all of you one way or another, too, sharing all our efforts and successes. Congrats from me too. I'm very happy for you. It's been great being in this class together, and reading your wonderful writings. I'm enjoying them and will continue to follow along with your adventures. Way to go, Liz! For getting into the show, but also for the rat-love. 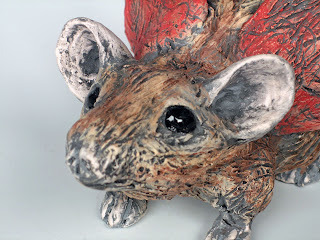 I've never much liked rodents before, but your sculpture suggests a more engaging critter than I would have imagined (something nice in the face, perhaps?). Congrats! Very happy for you. Looking forward to congratulating you in person Thursday night. Congratulations to you too Liz. It has been great to be in the blog class with you. I hope we manage to stay in touch.